My studio tour has been nearly nine months in the planning. It’s now less than five days away. 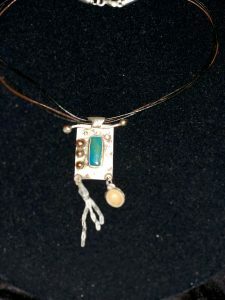 Part of my prepatory work included taking metalsmithing classes throughout the spring and summer. Not only did those studio hours expand my metalsmithing horizons, but they helped all other parts of my jewelry work. 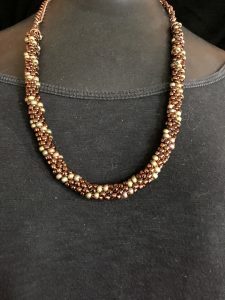 In beading, a familiar field for me, I learned new techniques Including kumihimo, a Japanese form of braiding. As an experiment, I incorporated kumihimo with crochet and loved the result. My time in the studio (in addition to stringing) included time playing with new types of clasps including a button one shaped as one of the most common symbols in the world, hands. To add to the challenge, I made my necklace into a three-strand presentation. 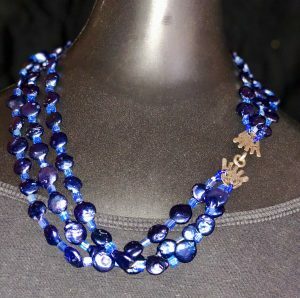 Because blue is one of my most favorite colors, I built a necklace around a blue infinity symbol made of lapis. The blue daggers on either side of the symbol are tumbled glass that I drilled in one of my first experiments with a diamond drill bit. 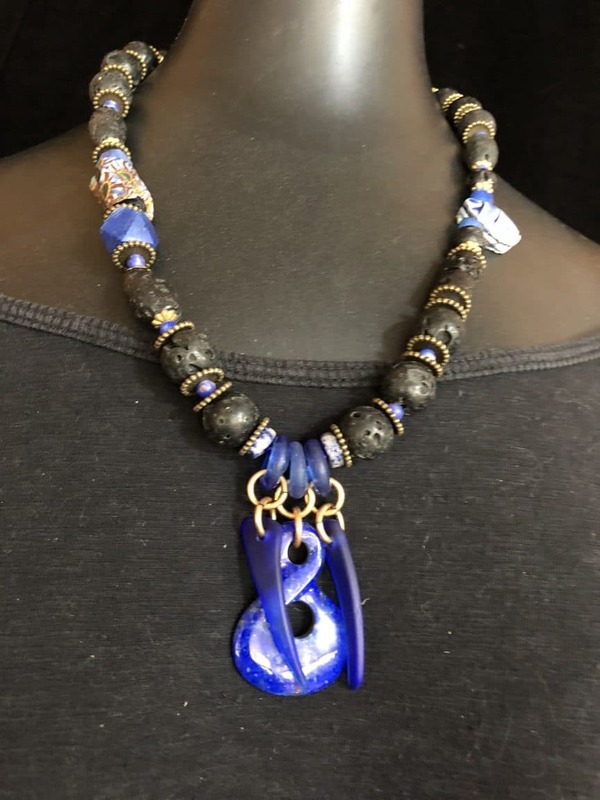 The scarab on the side and the vintage trade bead across from us are additional symbols. Or, maybe they are treasures. 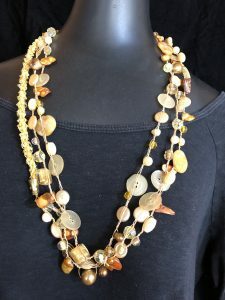 Each necklace I’ve created for this show is special. I can’t wait for you to see all of them. 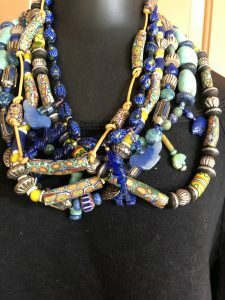 Here is a story with an emphasis on vintage trade beads and more blue. Join me for my eighth Sandia Heights Studio Tour Saturday and Sunday, September 15-16. Download a pdf brochure or a link to Google map.